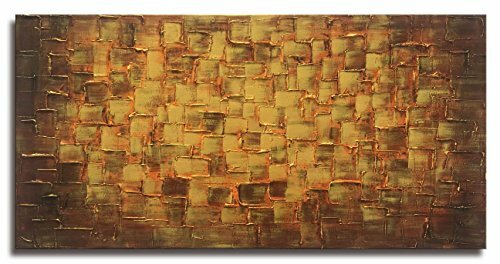 This textured abstract oil painting is 100% hand painted by our artists from sketch to finish, step by step. This dark blue squares canvas wall art are very popular in decoration market. We use gallery hand stretched canvas, artist grade professional oil or Acrylic colors, environmentally-friendly and never fades. The artist who made this painting, his experience is over 10 years. We assure you that every piece of art created is exquisite. Each art piece is checked carefully, including the art work, the stretcher, the frame and the packing, we will ensure it is perfect for shipping. If you are not satisfied with our painting, pls return it and we will refund you full payment after receiving the return painting or resend you new painting. If it is broken in transit, pls take a photo of package and send it to us, we will resend new painting to you or refund you full payment. The online image is just one angle of view. We sure when you obtain the actual painting, you will fell wow the actual painting is even more beautiful than the image. Come on, let's make your wall alive! The artwork's surface is very thick, textured, with 3d effect. It is a perfect wall decoration painting for living room, bedroom, kitchen, office, Hotel, dining room, bathroom, bar etc. If you have any questions about this product by MyArton, contact us by completing and submitting the form below. If you are looking for a specif part number, please include it with your message.